"Brilliantly captures one of the great saxophonists in jazz - and probably its most revered living improviser - during one of his most intensely creative periods. Startling performances. His music is always revealing; so is this loving tribute." "Revelatory and engrossing. A superb musical profile." "Widely hailed upon its release as essential viewing, not just for fans of jazz but for anyone even remotely interested in the creative process. [A] remarkable film." "An electrifying record of an artist at work." After completing his 1985 film THE RETURN OF RUBÉN BLADES for Britain's Channel 4 Television, Philadelphia-based filmmaker Robert Mugge began searching for another music-related project he could undertake in 1986. In seeming answer to that question, Mugge's good friend Francis Davis, a prominent jazz critic also based in Philadelphia, informed him that he had just done a long interview with jazz saxophone great Sonny Rollins, and mentioned how warm and welcoming both Rollins and his wife and manager Lucille Rollins had been. Davis went on to reveal that the Yomiuri Nippon Symphony Orchestra had commissioned Rollins to write an orchestral piece, and that, together, he and the orchestra would soon be premiering it in Tokyo, Japan. Rollins had composed long form pieces before, including his Civil Rights-related Freedom Suite in 1958 and his musical score for the 1966 British film ALFIE, but this would be his first work incorporating a symphony orchestra, which is why he brought in his friend Heikki Sarmanto, a composer from Finland, to provide arrangements and conduct the premiere performances. For Mugge, this seemed an incredible opportunity to make the sort of film he had long wished someone had made when John Coltrane premiered "A Love Supreme" or Duke Ellington premiered "Black, Brown and Beige" - two ambitious works of the past which had pushed the boundaries of jazz composition and performance. So, with Davis's help, Mugge, too, reached out to Sonny and Lucille Rollins and found them surprisingly amenable to a collaboration. The concerto was scheduled for two premiere performances at Tokyo Koseinenkin Hall on Sunday, May 18, 1986, and Mugge was anxious to secure permission to film one of those two performances. He soon learned from Lucille Rollins that both the orchestra and the concert hall were owned by Yomiuri Shimbun, the world's largest newspaper, as were the Japanese television network that would broadcast the first of the two performances and the Japanese radio station that would broadcast the second. Fortunately, this vertical integration of both cultural and corporate participants meant that Mugge was able to win full cooperation from everyone involved. The plan they worked out was that, while the television crew covered the first performance, Mugge and his crew would prepare their own approaches for shooting the second one. And since the radio crew intended a live broadcast of the second performance, Mugge's sound man could take a live audio feed from their recording and mixing truck while Mugge and his cameramen were shooting. Everything was falling into place. Funding, however, took a bit longer. But it, too, came together well enough for Mugge and three of his longtime collaborators - cameramen Larry McConkey and Erich Roland and sound man Bill Barth - to fly to Japan in time for the big event. Britain's Channel 4 Television agreed to cover more than a third of the film's costs, and a small U.S. theatrical distributor contributed almost as much. That still left some project costs unfunded. But Mugge decided to move ahead with what he had and to worry about the rest once the Japanese footage was safely in the can. Because Mugge could only afford two cameramen for shooting an entire orchestra performance, he knew they also would need to capture assorted scenes for use in establishing a different visual theme for each movement. Such scenes would include audience members arriving at the concert hall, Japanese television and radio technicians recording the first performance, a wide array of Japanese citizens racing around the streets of Tokyo, religious parades and rituals, the dazzling Vegas-like signs of the Ginza district at night, and more. He also knew that, prior to the concert, he would want to shoot individual interviews with Rollins and Sarmanto, as well as their personal rehearsals for the coming concerts. In the end, everything went exactly as intended. Back in the states, as Mugge began editing his footage, he decided that future shooting should build upon the idea of islands. With songs like "St. Thomas" and "Don't Stop the Carnival," Rollins had long celebrated the fact that his family had come to America from the Caribbean. Also, in his Tokyo interview, Rollins proposed that perhaps the reason the Japanese people loved him so much was because Japan, too, is an island; and he went so far as to point out that New York City, where he had been born and always since maintained a residence, is also an island. Finally, factoring in Rollins's wellknown commitment to solitary practice on his instrument (including more than a year and a half of round-the-clock playing on New York's Williamsburg Bridge), coupled with his commitment to a demanding physical and spiritual regimen, it was difficult not to see the so-called "saxophone colossus" as a kind of island himself. Although the orchestral footage had turned out wonderfully, Mugge also wanted to film Rollins performing with a more traditional jazz ensemble. Lucille Rollins pointed out that Sonny was set to do a summer concert on a small ship sailing around Manhattan, and that sounded like the perfect way to establish the notion of New York being an island as well. Unfortunately, when Mugge checked with the promoters, he learned that the concert would take place at night, and there would be no place for his crew to plug in sufficient lighting. Mugge then returned to Lucille Rollins, asking where else Sonny would be performing that summer, and she mentioned Opus 40, a sculpted rock quarry in upstate New York. Mugge therefore contacted Tad Richards, the longtime manager of Opus 40 and a stepson of the late sculptor Harvey Fite, who proved to be far more welcoming. With this new location in mind, Mugge then traded the "island theme" he had been imagining for a "colossus theme" which would be beautifully illustrated by Fite's monument-like rock structures. For the August 24 concert, Mugge was able to afford four 16mm cameras, one of which would be attached to Larry McConkey's Steadicam, plus a 24-track recording truck. As for Rollins, he and his topnotch ensemble (Bob Cranshaw on bass, Clifton Anderson on saxophone, Mark Soskin on piano, and Marvin "Smitty" Smith on drums) started off strong with a fierce new Rollins composition called "G-Man." The quality continued through a diverse set of additional songs, but came to an abrupt halt when, in the midst of some solo improvising, Rollins suddenly jumped from the sculpted rock stage to another level six feet below. As his feet hit the new rock surface, he fell onto his back, and simply lay there for a moment with his eyes closed. Then, just as suddenly, Rollins shifted his saxophone to his lips again and, without leaving his position on the ground, began to play the opening to the song "Autumn Nocturne." Eventually, his very relieved musicians on the level above him started playing along, and concerned audience members returned to their seats on blankets and lawn chairs. Rollins later stood up and played a couple more songs from that lower level before ending the show so his wife Lucille could drive him to a nearby hospital for testing. As is now well known, it turned out that he had broken his heel but had not wanted to disappoint the audience by halting the show prematurely. Several days after that, in a park in New York City, Mugge interviewed jazz critics Ira Gitler, Gary Giddins, and Francis Davis about Rollins's career. Critic Stanley Crouch had also agreed to participate but failed to show. Afterwards, Mugge interviewed Sonny and Lucille Rollins on the same park bench, discussing everything from Sonny's development as an artist to Lucille's roll as his wife, manager, and record producer. On this occasion, Sonny explained his Opus 40 jump from the stage as simply an attempt to approach the audience and play for them more directly. However, Lucille later told Mugge what Sonny had revealed to her, which is that a recent lacquering of his saxophone had caused it to make unexpected sounds that day, leading him to have almost a kind of nervous breakdown during his solo improvisations, which he finally decided to end by taking the ill-fated jump over the side of the stage. Of course, to fans of Sonny's career, his unfortunate breaking of his heel simply underlined his legendary commitment to his art. Lucille Rollins passed away in 2004, after suffering a stroke in 2003. That robbed Sonny of his greatest supporter, but not of his determination to continue developing his art. Unfortunately, a health issue forced him to retire from recording and public performance after a final concert in 2012, and he is now enjoying a quiet retirement at his home in Woodstock, New York. But Rollins's decades of extraordinary record and CD releases, as well as this 1986 film, give eternal testament to his greatness. In addition, Sonny Rollins has received countless honorary doctorates, been elected to the Down Beat Jazz Hall of Fame (1973), received a Grammy Award for Lifetime Achievement (2004), received America's National Medal of Arts (2010), been elected to the American Academy of Arts and Sciences (2010), and received a Kennedy Center Honors Award (on his 81st birthday, September 7, 2011). Just recently, it was announced that the Schomburg Center for Research in Black Culture, part of the the New York Public Library, has acquired Rollins's personal archive containing collections of his papers and recordings. As Rollins pointed out in a related statement, he was born on 137th Street, just two blocks from the Schomburg Center. Finally, an effort is under way to have New York's Williamsburg Bridge renamed for the world-famous jazz musician who once spent both day and night rehearsing on it. On July 7, Robert Mugge's 101-minute portrait titled SAXOPHONE COLOSSUS (after Rollins's classic 1956 album of that name) will be newly released on Blu-ray, DVD, and digital formats. 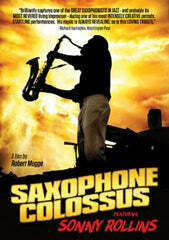 Mugge himself supervised the film's 4K remastering and created a new bonus feature titled LEAPS AND BOUNDS: Robert Mugge on the Making of SAXOPHONE COLOSSUS for inclusion with the new Blu-ray and DVD. Additional bonus features are audio-only performances of the Rollins compositions "G-Man" and "Don't Stop the Carnival," as recorded for the film.